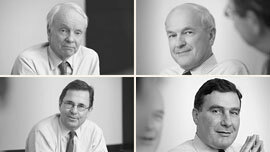 We invite you to browse through our website and learn more about Tweedy, Browne, our value investment philosophy, our long history and the people who are Tweedy, Browne. For over ninety years we have been active in the value investing business. It is our only business and it is how we invest our own money. As of December 31, 2018, the current Managing Directors and retired principals and their families, as well as employees of Tweedy, Browne had more than $1.1 billion in portfolios combined with or similar to client portfolios, including approximately $127.3 million in the Global Value Fund, $74.8 million in the Value Fund, $7.9 million in the Worldwide High Dividend Yield Value Fund, and $5.9 million in the Global Value Fund II -- Currency Unhedged. We have tried to make our website informative and encourage you to read about our history and our investment approach. We believe it is important that our investors and clients understand who we are and what we do. In the "About Us" section, you will learn about our firm, its origins and associations with some of the legends of value investing such as Benjamin Graham, the "father of value investing." Also, under "Investment Philosophy," we describe in detail our investment principles. In the "Research and Reports" section, you'll find an archive of quarterly commentaries, annual and semi-annual reports of our mutual funds along with research papers, numerous articles and interviews concerning Tweedy, Browne. We welcome your visit and hope you will learn more about investing and our approach to value. We also welcome your suggestions on how we may improve our website and better serve you. The information on this website is intended for U.S. residents only. Tweedy, Browne Global Value Fund, Tweedy, Browne Global Value Fund II — Currency Unhedged, Tweedy, Browne Value Fund and Tweedy, Browne Worldwide High Dividend Yield Value Fund are registered only in the United States and the information on this website does not constitute an offer to sell or a solicitation of an offer to purchase the Funds, which are not available to persons outside of the United States. Current and future portfolio holdings are subject to risk. Investing in foreign securities involves additional risks beyond the risks of investing in U.S. securities markets. These risks include currency fluctuations; political uncertainty; different accounting and financial standards; different regulatory environments; and different market and economic factors in various non-U.S. countries. In addition, the securities of small, less well known companies may be more volatile than those of larger companies. Value investing involves the risk that the market will not recognize a security's intrinsic value for a long time, or that a security thought to be undervalued may actually be appropriately priced when purchased. Dividends are not guaranteed, and a company currently paying dividends may cease paying dividends at any time. Diversification does not guarantee a profit and does not protect against a loss in a declining market. Please refer to the Funds' prospectus for a description of risk factors associated with investments in securities which may be held by the Funds. To view the accompanying prospectus please click on the Prospectus icon which appears at the top of the screen. Tweedy, Browne Global Value Fund, Tweedy, Browne Global Value Fund II — Currency Unhedged, Tweedy, Browne Value Fund and Tweedy, Browne Worldwide High Dividend Yield Value Fund are distributed by AMG Distributors, Inc., Member FINRA/SIPC. Certain employees of Tweedy, Browne are registered representatives of AMGDI. For the period October 1, 1994 through November 29, 2006, the Tweedy, Browne Value Fund was known as the Tweedy, Browne American Value Fund. This website contains historic content that was created during that period, referencing the Fund as the Tweedy, Browne American Value Fund. Because this material is still thought to be relevant, it is being maintained on the website in its original form. All references to the Tweedy, Browne American Value Fund in these historic documents should be deemed to refer to the Tweedy, Browne Value Fund.